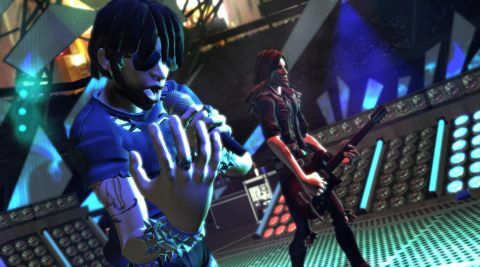 If the first Rock Band was the opening leg of a full-blown concert tour, with four players living the rock and roll dream via color-coded buttons and plastic guitars, drums, and microphone, Rock Band 2 is like the final show of that same tour. It’s not radically different from its already brilliant predecessor (at least not yet), but everything is tighter and runs more smoothly, and there’s an explosive, extended encore. Gameplay, for example, is almost the exact same massively fun shredfest you remember: Colored gems scroll down the screen in time with the music, you click buttons in time with the gems, somebody sings, and the crowd goes batshit. It’s totally euphoric. Yes, we said “almost” - there are several very welcome tweaks, like the ability to switch instruments and even entire band members mid-career, a “no-fail” mode, and custom setlists. Bassists can have a full career now, and there’s an online-enabled battle of the bands that should prove marvelously addictive. There’s also a drum trainer that will teach you the basics of actual drumming, should you wish to exchange this virtual band with a real one someday. All good stuff, though it’s more the perfection of a wonderful existing formula, rather than a totally new one. The new drums are wireless now and have a dozen barely perceptible improvements ranging from a slightly quieter sound to a kick pedal that stays put when you lift the kit. But they’re functionally the same – at least, until the optional, attachable cymbals (and possibly the rumored double-kick functionality) show up in early 2009. The same goes for the new guitar, which is prettier, has marginally clickier buttons, a screwdriver-free battery compartment and a fantastic auto-calibrate sensor, but feels essentially the same. You can even use the drums and guitar from the first Rock Band and forego the new gear entirely – nice bit of help for the penny-conscious. This refined entry replaces the original Rock Band as quite possibly the most fun-filled four person co-op game in creation. Just don't go looking for a huge evolutionary jump.